I've been living in Germany for the past 2 and this has afforded me the opportunity to really travel throughout Europe and become inspired with new ideas and new ways to create the type of business that reflects my truest self. I've learned that traveling is one of the best ways to stretch yourself, test yourself, create yourself, and connect with your truest self...all so that you can live the type of life you were designed to. So, I thought to myself..wouldn't it be awesome if I brought together 10 creatively curious people, who love traveling, love exploring the arts and cultural scenes of different cities, who are looking for a fresh new way to live out their dreams and business goals, and take them to 2 of my favorite and most creatively stimulating and seductive cities in Europe ...Paris, France and Amsterdam, Holland? Yes. Indeed it would. So that is exactly what I'm doing! 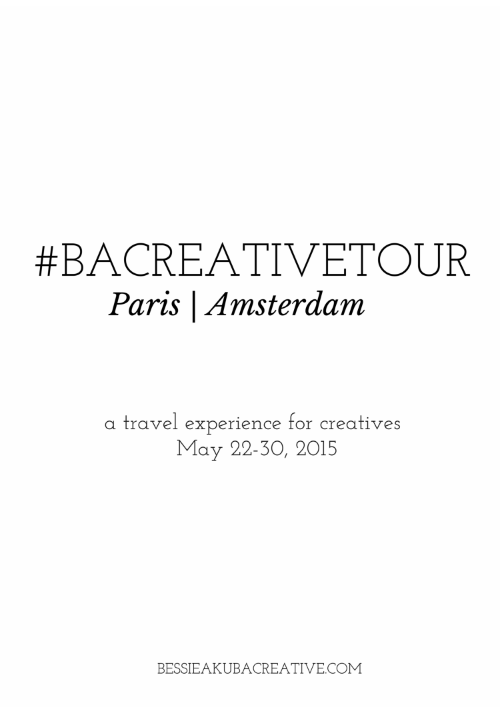 Who is this Tour For: Writers, Photographer, Designers, Consultants, Artist, and all the creatively curious wanderlustin’ folk who have valid passports. People who are looking to get out and explore their world and people who want to be hit with new ideas and new ways to execute them. Your payment of $2,535.00 includes hotel accommodations (in Paris and Amsterdam), transportation to and from the hotel, breakfast, ground transportation around Paris and Amsterdam, a local tour in Paris, admission to the Louvre, admission to Stedelijk Museum Amsterdam, round trip train fair to Amsterdam from Paris and back, a creative direction workshop, and an on location mini photo shoot. $2,535.00 Does NOT include your airfare to Paris from your home state/country, nor your meals throughout the day (with the exception of breakfast).. There are payment options available *yay* and your initial deposit is NON REFUNDABLE. When it comes to spending your hard earned money on traveling, you are investing your money into an experience that will transform your life and give you memories and lessons that will last you a lifetime. The current payment plan option is only available as long as you have paid your deposit by February 22nd. After February 22nd, the current payment plan will have changed. *One month before the tour, your will receive our official travel itinerary. Your down payment/initial payments in non-refundable. All other payments are refundable. Yes, you must be 21 or older and you MUST have a valid passport in order to participate in this tour.